Hundreds tell LAUSD they want services opened to the public. 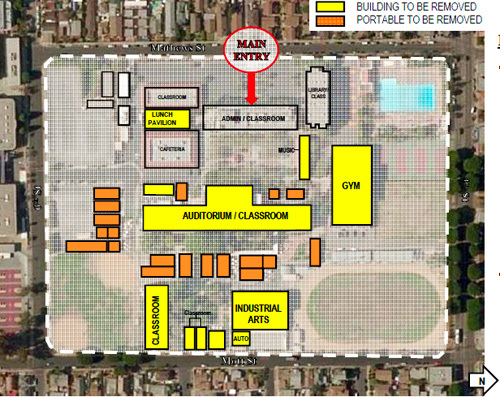 A forum Tuesday to provide information about major renovations scheduled for Roosevelt High School in Boyle Heights quickly went off track as speaker after speaker turned the meeting into a referendum on building a “much needed” wellness center on the campus. 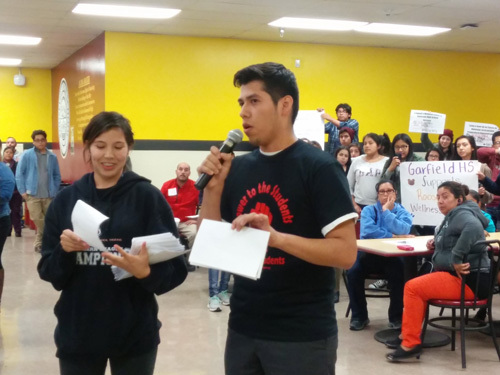 About 200 people, many of them students, attended Los Angeles Unified School District’s meeting to discuss long overdue structural work proposed for the campus. Built in 1923, Roosevelt is one of 10 schools LAUSD has selected to be upgraded with funds the District receives from Measure Q and other bond sales. About $100 million has been approved for the eastside school as part of the comprehensive modernization project. Any upgrades must include a large wellness center accessible to students and their families, several people demanded. “I have had experiences when I’m in class and I have a toothache and I’m not really paying attention at the teacher giving the lesson because I’m worried about my toothache, said Roosevelt 12th grader Mark Arenas. “ If there was a dental office here, [students] could fix that problem faster without missing a day of school,” he told LAUSD officials. Maria Ruiz has a special education student at Roosevelt and a 7th grader at Hollenbeck Middle School. She said building a wellness center is important because it would give help to those in need of physical or mental health services. It could provide mental health support to students who don’t have the support of parents at home, she said. LAUSD facilities development manager, Scott Singletary, repeatedly explained that they are in the “early stages” of the project, and he could not address the wellness center issue. As of now, the project is slated to address the campus’ most critical physical conditions, focusing on safety first. Ramps and elevators for disabled people included, he said. According to the proposal, the 91-year old school, which currently enrolls just over 2,600 students, five buildings on the campus — including the gym, industrial arts building and lunch pavilion — require major structural upgrades. Other areas targeted for upgrades include “parking and drop-off, landscape and hardscape and exterior paint.” No big changes will be made to the façade of the main building, according to the preliminary proposal. “Twenty-one percent of classrooms are in portable buildings and the infrastructure is in poor condition,” Singletary told the audience. Boyle Heights resident Blanca Dueñas commended LAUSD officials for the work they are doing but recommended that improvements be matched to student needs. “If you have a conversation with the community, we can all agree on the project, don’t do it alone,” she said in Spanish. Singletary said some things being proposed could change based on feedback rom the community, but added that the 5,000 to 7,000 sq. ft. wellness center people were calling for may not be possible. “It would be more like 2,000 square feet available for the wellness center,” he estimated. That’s not enough space, responded parents and students. They said they want Roosevelt to be a community school that provides students with 21st century quality education, and helps them lead a healthy life. The proposed modernization project does recommend replacing the existing school health clinic, and according to LAUSD spokesperson Elvia Perez Cano, the location will be determined during the design process. “The District is also continuing to seek opportunities to expand health care services that benefit our students and communities,” said Perez Cano in an email. Representatives from the AltaMed clinic in East Los Angeles and L.A. County Hospital said they support efforts to open a community wellness center at “AltaMed would be glad to be your partner,” Naina Davis told LAUSD officials, explain the nonprofit health care provides a variety of services including vision and dental care, and programs to prevent diabetes and obesity. The large-scale modernization could take two to four years to complete, according to the proposal. “We anticipate that the Board will consider approving funds for the proposed project in December,” said Perez Cano. If funding is approved, the design and environmental studies would be initiated. Then, community meetings would be held to share preliminary design concepts, she said. November 12, 2015 Copyright © 2012 Eastern Group Publications, Inc.